This Oats Rava Masala Dosa is a healthy and tasty Break fast recipe prepared with Oats and left over Idli/Dosa batter. Rava Masala dosa is one of the hottest selling dosa variety in all restaurants. I wanted to try some healthy recipe with this dosa variety, so I have used Oats and wheat rava. 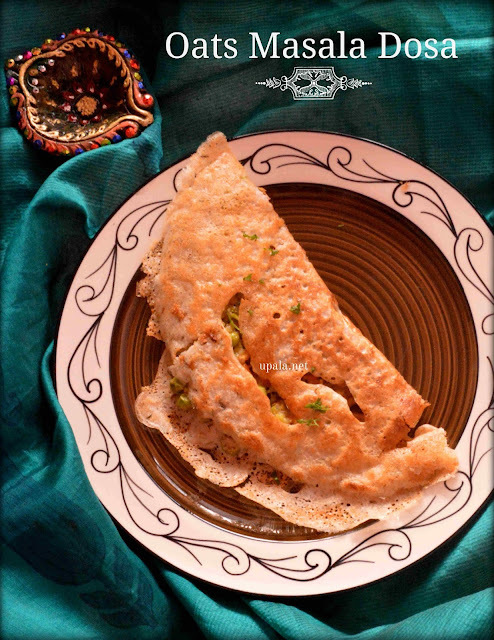 Also a speciality about this recipe is that no one can find that this dosa is made out of oats. 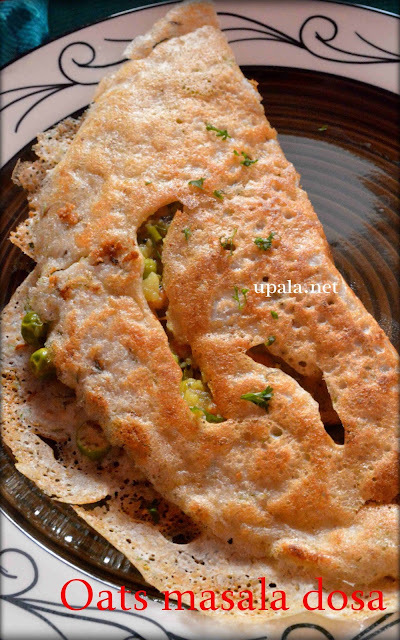 You can also prepare this dosa with out masala also and still it tastes so good. You can serve chutney or sambar as side dish. 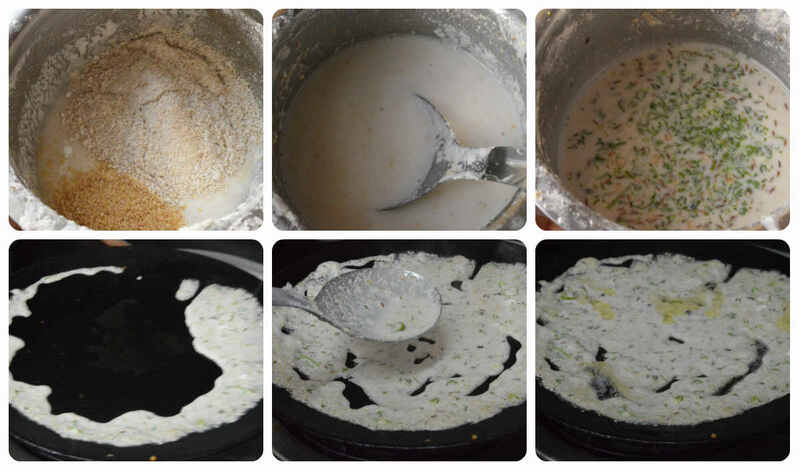 I have already posted Masala Dosa recipe which is one of the popular tiffen item. 1) Wash and clean the potatoes to remove the mud. 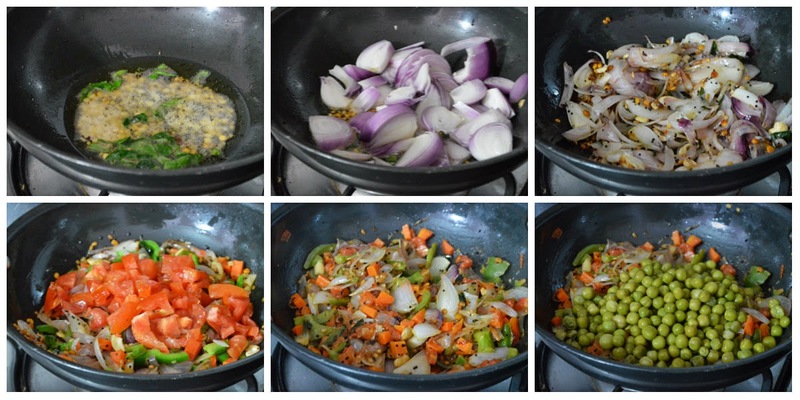 Cut each of them into 4 pieces and pressure cook along with green peas with 1 cup water for 3-4 whistles. I have kept green peas in a separate container in the same pressure cooker to save time. 2) After it cools drain water, peel the skin of potatoes and mash it. 4) In the meantime, heat oil in a kadai and add Mustard seeds. After it crackles add rest of the items one by one given in "For Seasoning".Fry till dals and cashews turn light brown. 5) Add Onions and fry till golden brown. Next add Green chilli, Ginger, Capsicum, Carrot and fry again. Next add tomatoes and fry till they turn mushy. 6) Now add cooked peas and mix well. 7) Add mashed potatoes, Turmeric powder, Red chilli powder & Salt, also Sprinkle few water and mix them. 8) Fry them for 2 mins and switch off the flame. Finally garnish with Coriander leaves. Your Yummy Masala is ready. 1) Grind the oats to fine powder. Now add Oats powder, Wheat rava (fine), Salt to left over Idli/Dosa batter and mix well. 2) Add enough water to make it as thin batter in running consistency and similar to Rava dosa batter. 3) Mix Coriander leaves, Curry leaves, Cumin seeds, Pepper, Green chillies to the batter and let it rest for 15 minutes. 4) Heat a dosa tawa and drizzle some oil and spread well. Pour a ladle of batter forming a outer ring then fill in the gap. Unlike regular dosa it can not be spread like an even circle. 5) Now drizzle oil around dosa also inside the circle where you find gap to cook in medium flame. This dosa demands more oil and more time to get cooked and to become crispy. 6) Flip it around to cook the other side. Once don, flip it again and keep the masala stuffing on half of the dosa and close it. Yummy Oats Rava masala dosa is ready..
1) I have used wheat rava instead you can go for normal rava. 2) As Idli/Dosa batter already has salt in it, add little less.